If you currently reside in the South Lyon, MI area and are looking to rent a party bus, then your search for a company is now at an end. Here at Rockstarz Limousine and Party Bus, we specialize in providing our clients with the most amazing time possible, no matter what it is that you are celebrating. When you are searching for a party bus in South Lyon, you will undoubtedly have a number of important points that you need to have covered. Also, you may be concerned about the number of people that can accompany you, but that’s not a problem. Thanks to the design of our party bus, we can now accommodate an even greater number of people meaning more guests can accompany you on this trip around town. Furthermore, our party bus rental in South Lyon will provide you with the perfect launch pad for an evening that will blow your mind. Of course, you have your own professional driver who will take care of you, but then there is also the stunning sound system that is more than capable of holding its own mixed in with a laser light display for added atmosphere. It’s no surprise to discover that people are left feeling as if they are in their own nightclub on wheels. 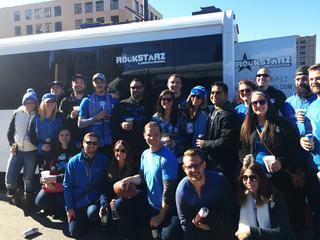 In addition, people have sought our party bus service in South Lyon for a whole host of reasons. Whether it be your birthday, a special anniversary, maybe you are also about to be married and are looking for a venue for your final party. No matter the reason, you are guaranteed to have an amazing time. So, if you do indeed live in the South Lyon area and are looking for a place for a party, then give us a call here at Rockstarz Limousine and Party Bus. Alternatively, you can go ahead and contact us via our website and someone will be in touch ASAP.